After her profession of vows, Sister Georgina taught elementary school in Shamokin PA, Detroit MI, Rochester NY, Montreal QC and Winnipeg MB. Later she taught high school at Sacred Heart Academy in Yorkton and Mount Mary Academy in Ancaster specializing in music, serving as the student's Prefect and also as guidance counsellor. She completed Teachers' College in Toronto, B.Ed. at the University of Saskatchewan in Saskatoon, and studies at McMaster University in Hamilton, in 1971. Sister Georgina a gifted choir director at Sacred Heart, enhanced the school's spectacular musicals. While missioned in Winnipeg, Calgary, Mount Mary Retreat Centre in Ancaster and Lourdes, France, her love and skill for music did not diminish. Her service in parishes and retreat work revolved around Liturgical music ministry. In Calgary, she inaugurated the singing of Liturgical responses in English. She taught Catechism and Ukrainian. Sister Georgina was on the Sisters' writing team for the children's Sacramental preparation program "We are Children of Light." She composed several teaching songs for this program. Funeral Divine Liturgy will be Friday, March 22, 10:30 at St. Joseph Ukrainian Catholic Church - 250 Jefferson Avenue, Winnipeg MB, Metropolitan Lawrence Huculak, OSBM officiating. Interment at Holy Family Cemetery. Charitable donations may be made in her memory to SSMI Lubov Foundation - Holy Family Home Building Expansion. 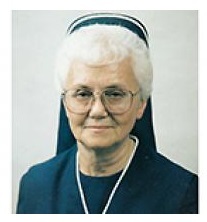 Sister Georgina's memory be eternal!